That day at the Chazen Museum of Art, Leslee Nelson stood before a group of about thirty of us, mostly women but a few men too. We stood in back or sat on squat canvas camp stools while Leslee stood in front of the wall full of embroideries, passing around the memory books with written remarks explaining each sewn square. Poised before us like a bright, flashing bird, Leslee was dressed in jeans, a bright magenta t-shirt, and black velour cardigan. Perched atop her head was a hat formed by two orange-feathered flamingos encircling her brow. It was fantastic. The room became a mad tea party we were invited to join. Leslee told us stories of the things that inspired her work, painful and extremely funny accounts about growing up with her family. They made us crow with delight or nod in sometimes rueful self-recognition. The room grew bright as our laughter broke the still of the museum, shimmering past startled oil portraits, bronzes, and glazed Chinese porcelains. Pinned to the grey wall, between two large openings that led into the small side gallery, these twenty hand embroidered memory cloths salvaged the materials of women’s lives: doilies, handkerchiefs, tea towels festooned with anchors and sailboats, colored dish cloths, place mats, fringed or not, mildewed, stained, starched and/or patiently ironed. Saved from the junkman, their frayed and worn surfaces were traced with colored stitchery. Startled childhood images emerged from the thread: raw stick figures, straying airplanes, railroad tracks to nowhere, a set of precariously balanced red apples, two sober green pickles both “good and bad:” a tiny, wary devil peering wild-eyed behind hatchmarked foliage peppering a bright red cloth. When I look at these cloths, I recall the Betsy McCall paper dolls that I cut out and stored in candy tins, young girls’ samplers of the 19th century, or the cloth-bound storybooks of my mother’s childhood. Leslee’s figures refuse easy sentiment or nostalgia. They appear lopsided, primitive, and naïve. But their simplicity is deceptive. They burn into us: brooding, spare, witty, aching in their comic appeal. They evoke not only the cartoonist Roz Chast’s off-kilter family world, but also Goya’s winged nightmare phantasms. 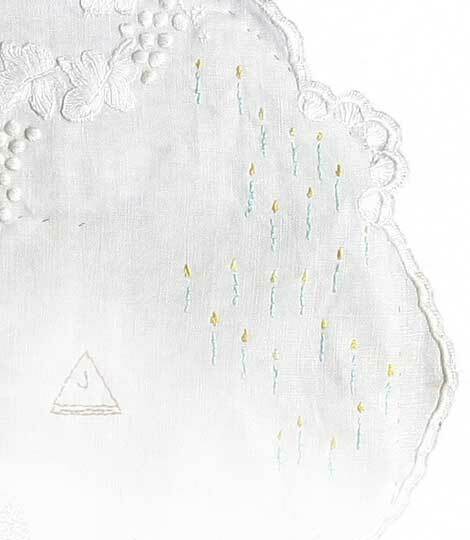 We gaze at Leslee’s raw, stitched figures, precariously perched en scene, as if floating, not tethered by gravity but held in place, barely, by the embroidered thread willing them to the stretched worn linen. Leslee grins at us as if to say, “I’m here, orange and feathered. I survived. Here are some of the monsters I wrestled and here are some of the treasures from my descents.” She makes it look easy, this process of plumbing her buried childhood realm. There is an implicit invitation in the homey familiarity of her work that mirrors the household skills of women and mothers: knitting, darning socks, sewing on buttons. Worlds held together by threads. “I did this, so can you.” Inwardly, we marvel at her fierce determination to return again and again to her basement realm of memory. Who knows what waits for us at the bottom of the stairs? Leslee’s memory cloths guide us on a mythic journey. She whistles past her demons, willing herself to release these boxed-up terrors; descending again and again into the depths of buried memory. She picks off the dusty and ancient moths that graze her skin, then pins their vein-laced wings to the cloth, swaddling and tenderly binding them to this world with brightly embroidered tracery. She ignores their tiny mandible bites as she covers and rewraps their old and violent bodies with stitch, upon stitch, upon stitch, of the needle piercing the cloth of memory. She remembers, then pierces the needle again into the cloth, reworking that memory once more until it sits up antic and wild-eyed, propelled from the underworld, to arrive crayola-bright, stitched to startled new life in her cloths. She is Penelope at the loom, weaving and reweaving the stories of her tapestry, the spindle pushing through the warp threads until the world as she remembers it reappears with the return of her lost warrior husband, as if from the dead. . .
That afternoon at the Chazen, I asked the others in the audience to consider how we might have regarded Leslee’s memory cloths if we hadn’t heard her remarkable stories? Walking by, we might have missed their mute appeal that we consider them for awhile. Their small-scale domestic handiwork, and perishable mediums of colored thread and reused linens, make them easy to overlook. But their off-kilter presence comments silently on the museum’s collections of antique, classical, modern or postmodern importance. If we pause and look closely, we might notice how the cloths sometimes crouch beneath our sightlines and dare us to find them, hidden in the rushes, lying in wait. Their audacious presence in that sober museum room demands that we question what we value and what we throw away, what we remember and what we repress, what we hold up to the world and what we hide. They tease and trouble our comfortable assumptions about what we hang upon our walls, discuss with our families, blazon in our headlines. What’s missing? What’s lost? What’s fallen beneath our attention and regard? Why do we overlook, ignore, refuse the least, the smallest, the most vulnerable, the most delicate things in our lives? When we deny them their place, do we lose our way? I am drawn to these works as if drawn to broken parts of my own soul. They are intense, private, hidden, magical, funny, brave, elusive and breathtaking in their dare to engage us. They are profound, deeply human, and subversive in their deceptively quiet way.